As the reader can glean from the title of this Blu-ray disc and its varied repertory, this is one of those theme-centered recordings gathering together a host of unrelated works or parts of works. Here, the fare consists of grand endings in music, more or less. 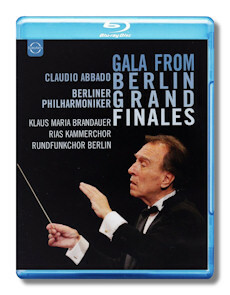 Normally, you would expect such a disc to be drawn on excerpts from complete performances, but that isn't the case here: the various finales, overtures and other numbers on this disc were chosen by the late conductor Claudio Abbado to comprise a concert of triumphant endings or at least of celebratory statements in music. The works listed on the first half of the concert bill are both more serious and longer than those in the last half. After the Schoenberg Gurre-Lieder selection, there is a series of light works, some associated with famous operettas. The "serious" music covers various periods and styles, from symphonies by Beethoven and Dvořák, to choral works by Ravel, Prokofiev and Schoenberg. The lighter music features much variety too, from the festive fluff of Lincke and stately but prankish Waltz of Translateur to the bubbly effervescence of Fischer and subtly crafted overture of Nicolai. So, there's something here for everyone. As is the usual case with Abbado, his interpretations are spirited, detailed and mostly competitive with the best renditions, even with some of his own previous work. The Beethoven Seventh finale brims with energy and is brilliantly played by the Berlin Philharmonic; ditto for the Dvořák Eighth finale, certainly among the best performances on this night. I would say all the lighter fare is splendidly played as well, with the Nicolai Merry Wives Overture and the Kollo Solang noch unter'n Linden being particularly outstanding. The Nevsky finale, Alexander's Entry into Pskov, seems a little relaxed alongside Abbado's very potent account from the complete work's recording with the London Symphony Orchestra on DG. Still, it's a reasonably good performance of this powerhouse finale. What strikes me as a bit out of place here are the Gurre-Lieder excerpts, Herr Gänsefuss, Frau Gänsekraut and Seht die Sonne. (By the way, Herr Gänsefuss, Frau Gänsekraut is not identified in the album credits, though I have listed it above). The music is certainly excellent, and Seht die Sonne delivers a grand ending alright, but the narration of Klaus Maria Brandauer in Herr Gänsefuss, Frau Gänsekraut, effective though it is, seems to add an element of angst that doesn't fit in well with the generally festive mood. But, as I say, there's something for everyone here. The camera work, picture clarity and sound reproduction for this 1999 concert are all pretty much state-of-the-art for their time. Texts are included. If you like big endings, triumphant music and a healthy dose of light fare, you'll certainly find this disc to your liking. It's a fine tribute to the late maestro Claudio Abbado.